If you have never had scones with clotted cream and jam, you just don’t know what you’re missing. Biting into one of these makes my eyes roll back into my head. 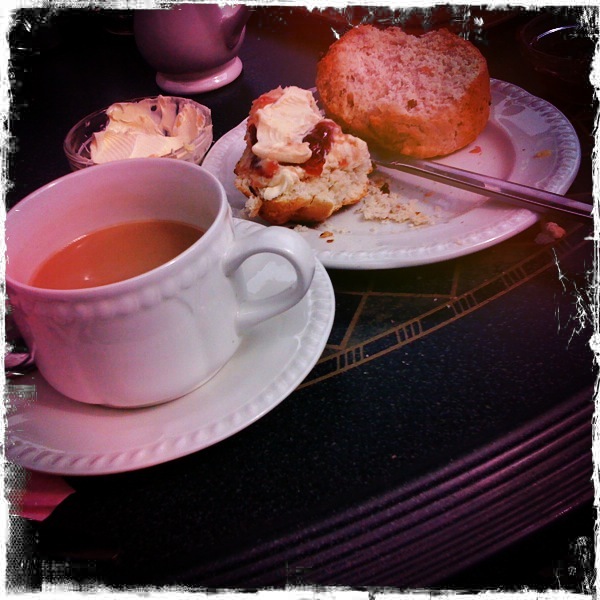 We ate these scones in Sidmouth, in a little tea shop on the top of a cliff overlooking the bay. It was noon and when I asked AP to order a cream tea for me, he said he was embarrassed because tea is taken at 3:00 PM and not noon. Have you ever heard of anything more silly than that? Me neither. I ordered and ate the scones with jam and cream and AP even helped — and not one word of complaint from him, either. Oh, these Europeans! I remember asking for a croissant and cafe at 5pm in Paris and I thought I was going to be guillotined. Mon dieu! No, this was a bit cool. I think they took it out of the freezer.